Today is a very special day as we are reaching the milestone of 1000 articles on TechWalls very soon. To celebrate the event and appreciate our readers in the last 2 years, we decided to host a gadget giveaway for you guys. 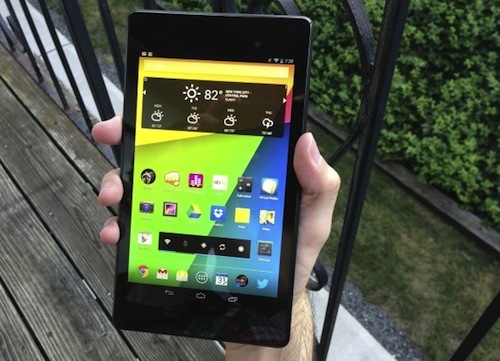 The prize of the giveaway will be the Google Nexus 7 (2013) 16GB, the hottest tablet of the summer. The new generation of Nexus 7 tablet features a more compact design, more powerful processor, more RAM, Android 4.3 Jelly Bean and gorgeous display of 1920 x 1200 pixels with 323 PPI. The 16GB edition of the Nexus 7 2013 is being listed on Amazon for $229, very affordable price for the awesome tablet. The giveaway is co-hosted by TechWalls, Dragon Blogger, CravingTech, Techetron and The Game Technician. This giveaway is open to our readers worldwide over the age of 18 where rules and restrictions apply. If you live outside the U.S., you can choose to get $229 in cash via Paypal. If you agree to pay for shipping, I will order the Nexus 7, then ship the device to you. Notice that this will take more time to ship overseas to you. To increase your odds of winning, you can share your custom link in the PromoSimple giveaway and convince others to sign up with your referral link, up to 250 bonus entries can be gained this way. You can also tweet from the widget once daily to get more 30 entries. The contest will end on August 31st 2013. Now, enter for the chance to own the awesome Nexus 7. Good luck! Completed all the steps ! Fingers crossed ! Amazing offer i m surely going to order this tab. Cool giveaway man. The device is pretty much improved as compared to the predecessor. Gonna get an entry asap. Thanks for this excellent giveaway! Yes this is an unbelievable device for the price of $229. Actually I bought one for just $207. Awesome Giveaway. This device will help bloggers to do their work even in more better and easier way. No need for laptops while traveling its a complete package. I am currently don’t have any tablet/ipad. I hope I can win it.